You know that country between Russia and China? That country that no-one really talks about at all, and the last time was involved in something was in the 1200s. I am of course talking about Mongolia. Recently I have been researching interesting places in the world to travel to, and Mongolia is high up on that list, of obscure places where people don’t usually travel to. Once of the reasons my eyes were set on Mongolia, was due to this beautiful performance and the stunning views behind him. As a photography enthusiast, I just jump at any opportunity to take some amazing shots of exotic places around the world. And I believe Mongolia will offer me some great views. Lets hope that my plans work out and in 2018 Feb I will cruising down the valleys of Mongolia. The fashion monster of Japan is back to Sydney for another live concert! This time as part of her 5 year anniversary world tour. Once again us Kyary lovers gathered to watch the pop idol perform. This time however, they had an option of VIP tickets, which allows the fans to get a photo taken with Kyary herself! (photos done by professional photographer and will be available for download on the 4th of July; See below!). Also included in the VIP package was the chance to be first in line for good and first to access the concert hall, which equals front a row position! That was probably the main reason that made this concert so much better then the previous – the opportunity to be really close to Kyary and actually see her face and cute smile. Featured in Project Mirai 2, this song is a great representation of the robotic nature of Miku and the song itself is rather catchy. Even though its really challenging in Expert mode in the game, I enjoy failing it every time. When I was a kid, my parents used to take me to watch theatre plays, operas and of course symphonic orchestra performances. I’ve heard my fair share of Bethoven, Mozart, Bach, Tchaikovsky. And during my high school days, I also played a fair share of their pieces as well, while being part of the school orchestra. But ever since I came to Australia, I haven’t had the chance to go to anything of the sort. And the only time I’ve been inside the opera house, was when I went to watch a rock concert by Tenacious D.
This November, the Sydney Symphonic Orchestra is preforming a rather unusual set of songs. They can not be defined as classical music and they were not even originally written for an orchestra. These pieces are the OST (Original Sound Track) for the Pokemon games! 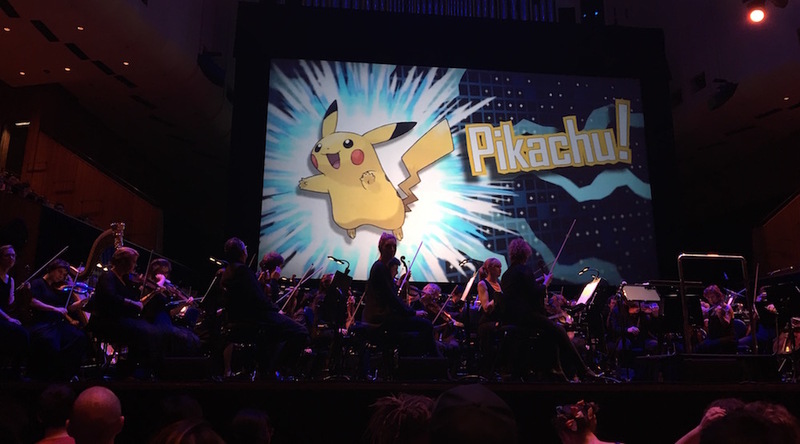 The concert is called Pokemon Symphonic Evolutions and the orchestra performed a variety of soundtracks from all Pokemon generations 1-6. It was truly a beautiful experience to hear soundtracks that defined your childhood performed as a symphony. Angela Aki is very popular Japanese singer and composer, who also plays piano and the guitar, and who sings a lot about love, home, dreams, and life. She is only 36 and has been well knows ever since her debut in 2006 in the Budoukan Hall, making history there as the first artist to ever perform in the famous venue solo (with just her piano) — no backup singers, band or opening act. So far she has released 8 albums and has been preforming all over Japan. Angela Aki is also a very unique performer for Japan as she is not fully Japanese. Her mother was American and father Japanese, but she was born and brought up in Tokushima, Japan. But nevertheless Japan loves her. And so does my Amy. People say Amy looks a but like Angela, and I can agree, both very pretty girls. It seems like I am only talking about music these days eh? I am just busy working on/learning how to create something awesome. This is the newest song by one of my favorite J-Pop idols: Kyary Pamyu Pamyu. Its called Kira Kira Killer, but its not about death, its about being struck with new ideas and about creativity. So PSY has just released a new song called Hangover and as you can expect its about drinking. Its even more crazy then Gangnam Style and Gentlemen and it has Snoop Dogg! So far its up to 3 million views in just half a day, lets see what happens when the rest of the world wakes up! Kyaaaaaaaryyyyyyyyy, one of the most ‘unusual‘ J-Pop idols visited Sydney last weekend, and how better to celebrate your 6 month anniversary with your girlfriend, then by visiting this concert! It is the first time that Kyari visited Australia, and it seems that she rather likes it here! This one and a half hour concert featured all of her most popular songs, as well as some new and less famous ones. It was a very nice way to spend one of my last days in Sydney for 2014; together with my friends like Seb, Ruben, Clara, etc. I managed to take a lot of photos with Amy’s iPhone and she posted them all up: here. Kyari is continuing her world tour now, and hopefully she will come to Sydney again next year! Better quality photos of the concert: here. Blumenkranz – in german it means a wreath of flowers (ring of flowers) and that is what normal german speakers would think if they heard anyone say this word. Well if anime fas, who are watching the show Kill La Kill hears this word, they will undoubtedly think of the second best track from the OST (Original Sound Track) which bears the same name – Blumenkranz.